We Love our Customers and want to reward them always, not just after they’ve visited X number of times. 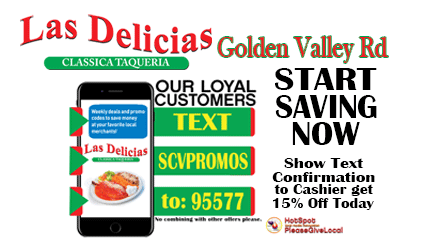 Come save now and later with SCV Promos at Las Delicias Golden Valley Road. Visit us on Golden Valley Road and get your First of Many Great Deals. Breakfast Lunch or Dinner has never been so good with a very special Customer Loyalty Reward!